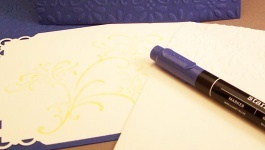 The idea of making your own wedding invitations is really exciting to you. You have that crafty side that is just dying to get out. You like the fact that you will be able to make each and every invitation unique and special. You also like the fact that you are potentially saving a whole lot of money on invitations doing them yourself. So you have bought the materials, you’re ready to go, and that’s when you realize that you have to actually do more than just make the card – you have to write something inside of the card. What are you Inviting them To? For the location, if it is a well known spot then you do not need to include an address. If it isn’t a well known location, include the title of the place your wedding is going to be at as well as the actual address, including the city and zip or postal code.